Lydia Dyar, whose flamboyantly patriotic gravestone in Billerica is the subject of the essay I am working on at the moment, was a small-scale merchant. Nearly every spring between 1760 and 1774, she advertised in the Boston newspapers, touting her new stock of imported garden seeds. At her shop in the North End of Boston, customers could find a variety of vegetable seeds — cabbage, spinach, carrot, turnip, lettuce, cucumber, squash, cauliflower, pea — along with beans, herbs, and flowers. Even during the height of the nonimportation crisis, the Widow Dyar continued to buy seeds from London and Messrs. Edes and Gill of the Gazette, strong Whigs both, continued to run her ads. Unlike the unfortunate Cummings sisters, whose business activities attracted the ire of a tar-and-feather-wielding mob in October of 1769, Lydia Dyar and the other seed sellers of Boston went unmolested. 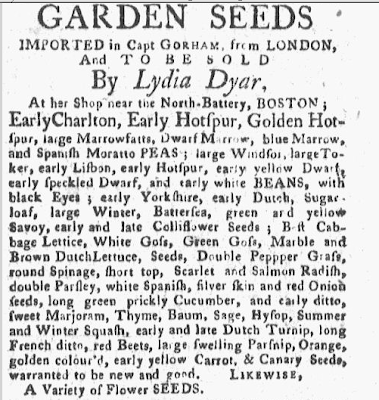 The March 6, 1769 issue of the Boston Gazette carried five seed sellers (Lydia Dyar, Abigail Davidson, Elizabeth Greenleaf, Bethiah Oliver, and Susanna Renken), all of whom advertised their wares as imports. A year later, when tempers were running high over the Boston Massacre, Dyar omitted the word "imported" from her ad, though two other sellers (Davidson and Renkin) still advertised their seeds as "Imported in the last ship from London" (Boston Gazette, 9 April 1770). Why did Edes & Gill, not to mention Boston's infamously active crowds, give Dyar and the seed sellers a pass? Their names are never mentioned in the lists of "Enemies to their Country" that splashed the names of other importers across the front pages of the Gazette. I have found no record of their houses or shops being targeted for violence, and they never suspended their advertisements. Why did Ame & Elizabeth Cummings merit a many-pronged assault that culminated in a formal charge of treason, while Lydia Dyar received a gravestone that cast her as a martyr who fled her home "to escape ye abuce of ye Ministerial Troops sent by GEORGE ye 3d to subject North-America to Slavery"? Type of Goods: Lydia Dyar sold vegetable seeds, while the Cummings sisters sold jewelry, silk, and other fancy goods. While seeds could be seen as patriotic (a self-sufficient America can feed itself! ), imported lace handkerchiefs fell into the no-no zone of frivolous, corrupting luxury. Both of these types of goods would have been purchased primarily by women, but they sent very different messages about the colonies' potential for economic independence. I wonder, though — why weren't they purchasing Massachusetts carrot seeds from Massachusetts growers? Family/Community Connections: Lydia Dyar was an elderly widow whose father was a North End chandler and whose son was a dockside cooper. Her family had lived in Boston ever since there was a Boston to live in. Her parents were married by Cotton Mather in 1693 and she had been a congregant of the New North Church for her entire life. The Cummings sisters did not have any such connections. Like most of the merchants on the "enemies" list, they were Scottish (their parents were immigrants) and Anglican (attended services at King's Chapel). The sisters were proteges of Elizabeth Murray, the Scottish merchant whose brother rented his sugar warehouse to the King's troops as barracks, and friends of John Mein, whose Tory Boston Chronicle was a thorn in the side of every Boston Whig. I don't think that the problem can be reduced to a matter of tribalism, but there seems to be a stark difference between Dyar's place in the community and the Cummings sisters' outsider status. Time of Year: The seed sellers typically advertised in February, March, and April. The mob actions of 1769-1770 were at their peak between October and March. In 1770, Lydia Dyar did not place an ad until April. Perhaps the seed sellers' 1769 ads were too early to cause too much controversy and they held off until things had cooled down in 1770. Insert your pet theory here: I'm taking any and all suggestions at this point. Feel free to speculate in the comments! I suspect your top two reasons are the operative ones. Patriots probably saw good seeds (like wool-cards) as a way to increase American production, and therefore worth excepting from the list of items not to be imported. And the boycotted shopkeepers tended to be Anglican (Cummings, Lillie) or unpopular for other reasons (Jackson, whose shop was the source of the great 1760 fire). Susanna Renken's signature appears on the Oct. 28, 1767 non-importation Boston broadside––one of the six newly discovered copies at the Houghton Library. I was curious about who the women were who signed––and discovered her ad and your article. This could add a new dimension to your story.